SIGNUP+yourlibrarycardnumber to 303-309-0028 (example: SIGNUP+21393001234567 - NO spaces and include the "+"). You will be prompted to enter your PIN, try the last four digits of your phone number. Notifications: You will automatically be signed up to receive notifications about holds, overdue items, item renewals, events and closures. Text notifications apply to physical items only. All eLibrary notices are delivered via email. Opt-out: Text STOP to opt-out of the service. 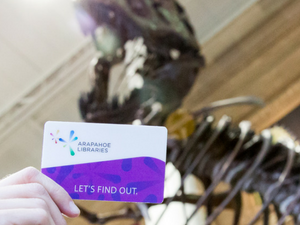 Pro tip: Save the contact as Arapahoe Libraries so you know it's us! How do I sign up for text message alerts? What do I need to sign up for text message alerts? What text alerts will automatically be sent? Can I opt in or out of different text alerts? Can I get text alerts for more than one library card? Can I get text notices for eBooks? How do I know if my phone will work with the text message service? I recently switched phone carriers. How do I continue to get my text alerts?